The change of season is nearing (finally!) 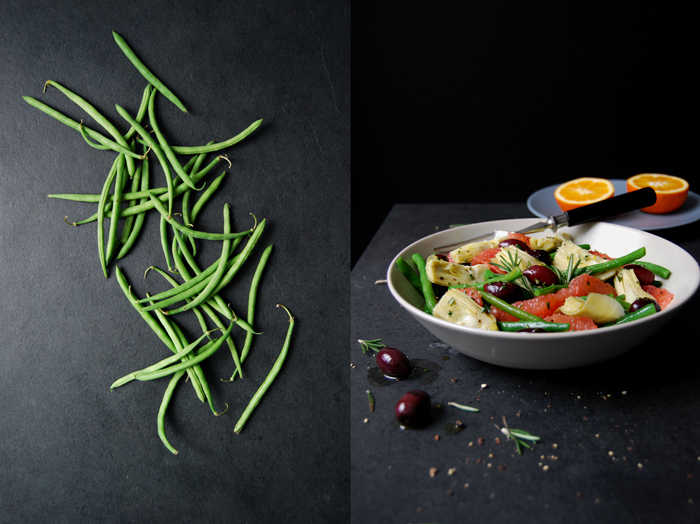 and the first spring vegetables are back in my kitchen, green beans! They aren’t locally grown and had to travel a bit to reach my cooker but their crunchy green gave me culinary proof that the end of winter is near! The recipe is easy, I went for a quick bean salad with bittersweet pink grapefruit and a light rosemary orange dressing. I had a colourful plate in mind with lots of different flavours, antipasta feeling combined with sharp freshness. 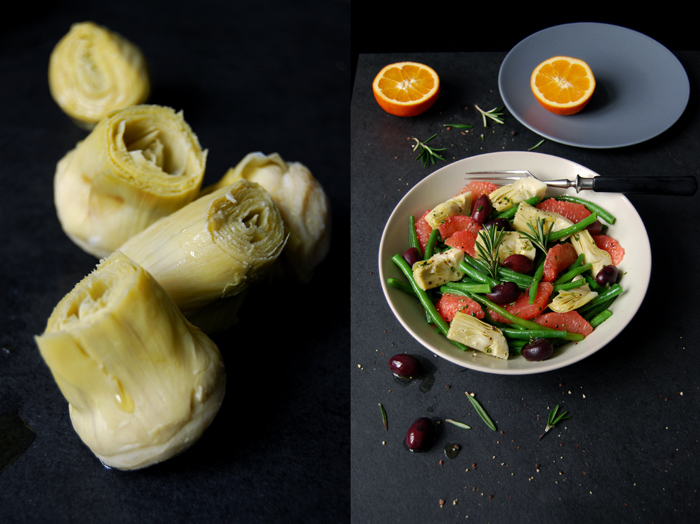 I pulled out a few pantry treasures to mix with the fruit and vegetable: preserved artichoke hearts and juicy Kalamata olives. 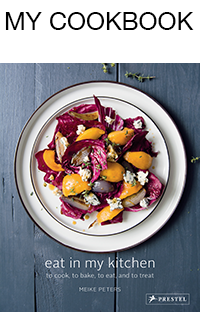 A strong composition without a single overpowering ingredient, the perfect salad to get prepared for all the summery, culinary pleasures ahead of us! Blanche the beans in lots of salted water for 4-5 minutes or until al dente, rinse with cold water for 2 seconds and drain. 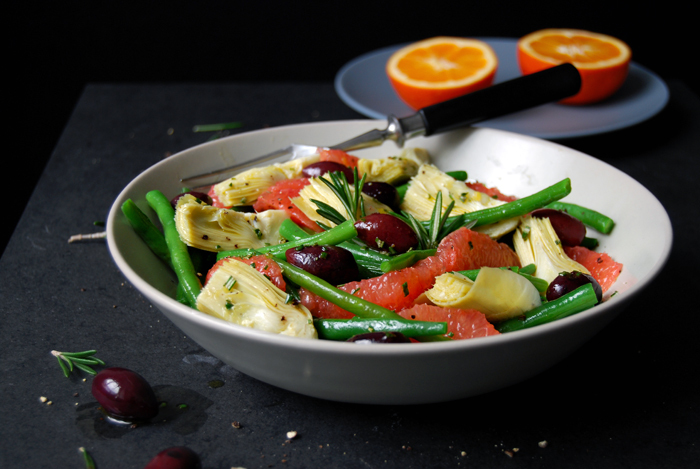 Arrange the beans, grapefruit, artichoke and olives in a large bowl. Whisk the olive oil, orange juice, rosemary, salt and pepper and season to taste. Sprinkle the salad with the dressing and serve immediately. shut up! 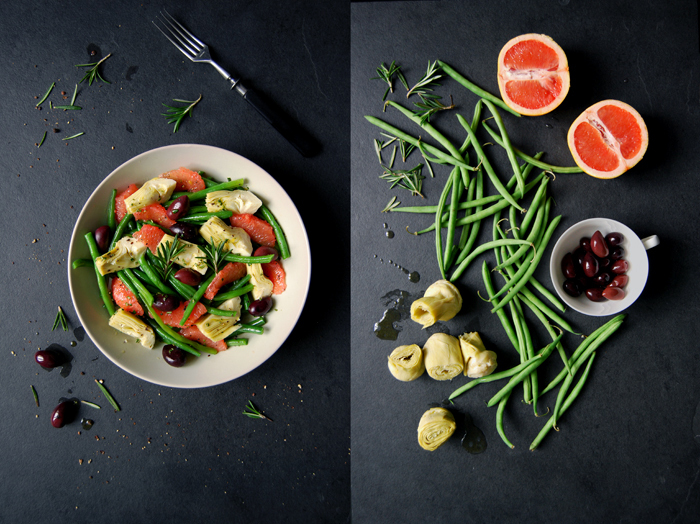 grapefruit with these bits of artichoke love, meike?!?!? i cannot even imagine-visualize how this dish will taste. 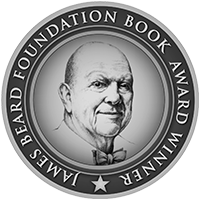 i am stunned and stoked. you are truly my “new flavor combination” guru. dear flavor profile magician… i rarely follow a recipe exactly more than two times. the first is to understand what the creator wishes for me to taste. if i go for an identical round2, it is because my tummy cannot resist the pull. the third time around is when i introduce my own knowledge, curiosity, and cravings. this share? 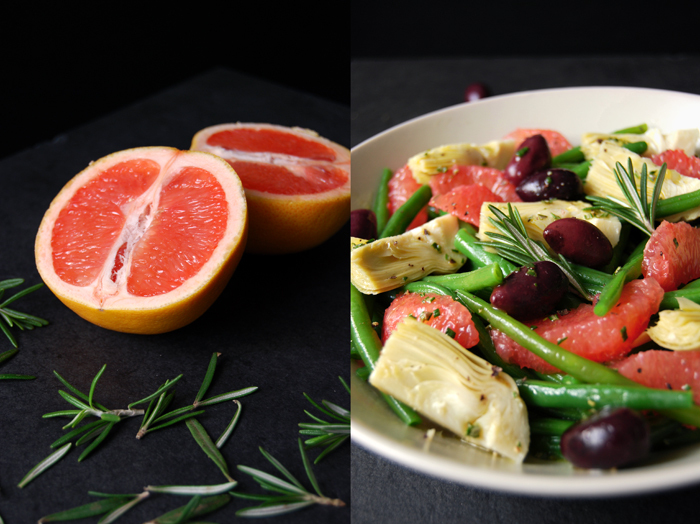 i waded through a lot of pink grapefruits and made a lot of other pink grapefruit dishes and drinks because i wanted the perfect one for your salad. i also waited for the perfect haricot vert to hit the farmers market. yesterday was the day. i ate both servings. after my fat-tummy nap, i made it again. i ate both servings. ashamed? no. piggy proud? yes. meike rocked it out happy dance? ohhhh, yes. Oh my gosh, that looks so delicious…you pair foods together, I would never think work, but they always do. Have a wonderful week, Meike.